I love pasta. All kinds, filled, short shapes, long shapes, rustic, fancy. All of it. The sad part is that you really can’t get good classic pasta in Hawaii. There are tons of good noodles but not pasta. None of those soul satisfying, slurp up and get tomato sauce all over your shirt, chewy pillows of goodness. Since I require that on a regular basis, I end up making a lot of pasta. This time, I wanted filled pasta. I also wanted to keep my trend of making foods I can have prepared for later cooking in my freezer. Ravioli fit the bill perfectly. Make sure to remove all the air bubbles from around the filling when you are closing the pasta. If you don’t, the pasta will float up immediately and then burst, leaving you with a big pot of boiling water and cheese bits – not as appealing. Make sure your seal is tight. Press it between your fingers if you need to when you first try. 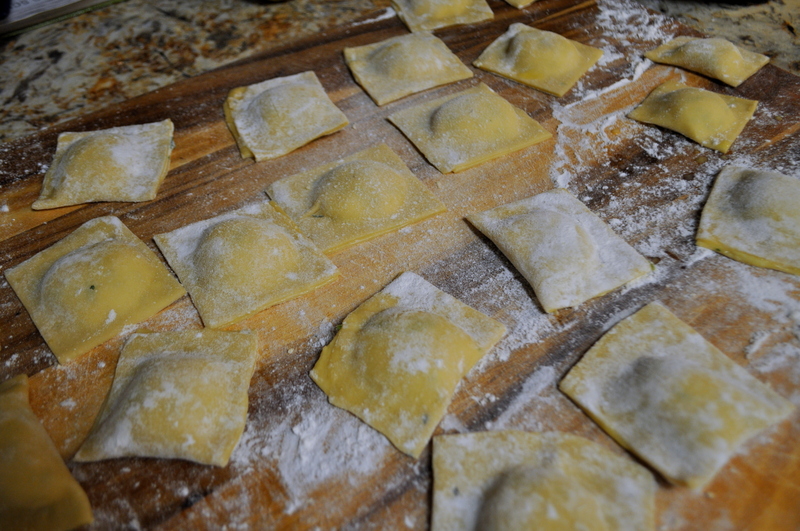 It is better to have a slightly squished ravioli than one that falls about in the water. As you get more familiar with the process, you won’t need to do that because you will have become a master at sealing just with a little egg wash and pressure.